Race a tricked out ambulance on a mission to round up the crazies in this free racing game. FREE FULL VERSION GAME! NO BANNERS, NO ADS, NO IN-APP Purchases, NO ADWARE! 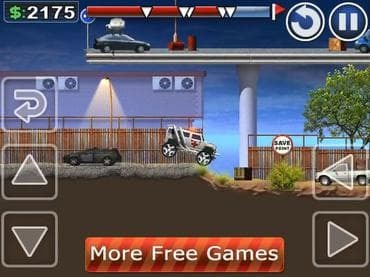 Bring out the straightjackets, fire up the electric shock treatment....scratch that, in this thrilling and bone-crunching free game you guide an ambulance driver on a mission to round up the crazies, and the only way to do that is to run them over. Elaborate graphics, cool sound effects, and a suspense filled score create an additively fun and entertaining game. Play this free game today and help catch the insane before they seize your town. If you have questions about Mad City Race game, please contact us using this form.